Note the spelling. Java programmers rarely spell it correctly. This essay looks a little different from my usual style. That is because was published in 2001 Volume 6 issue 6 of Java Developer’s Journal. The date and time classes are the most poorly designed of all the Sun class libraries. The standard class libraries force you to deal with time zone and time of day, even when they are irrelevant to your problem. The vocabulary used in the various date classes is inconsistent. First, a quick review of what you probably were taught about the calendar in elementary school. The earth rotates every 24 hours. The sun is highest in the sky at solar noon, once each rotation, for any given spot on the earth. Railway schedules where hard to coordinate when towns even a few miles apart celebrated noon at a slightly different instant in time. So, Sir Sandford Fleming invented 24 time zones, within each, time was uniform. Astoundingly, he managed to sell the idea to the entire planet. The boundaries are essentially meridians every 360 ÷ 24 = 15 degrees (1 hour). There are jogs in them to accommodate political realities. The earth rotates from west to east. This means the British see noon, 5 hours before New Yorkers who see it in turn 3 hours before the inhabitants of Seattle. London is time zone UTC:0, New Yorkers EST/UTC-5, Seattle PST/UTC-8. In other words, to get Seattle time, you take UTC (Coordinated Universal Time/Temps Universel Coordonné) (similar to GMT (Greenwich Mean Time) ) and subtract 8 hours. Anyone who has flown over the Pacific ocean to Asia has crossed the International date line. When you cross it going west to east, the day of the week jumps ahead a day. The planet does not simultaneously flip from Monday to Tuesday. The people living just east of the International Date Line flip first, then an hour later the people living 15 degrees east of that flip and finally 23 hours later the people living just west of the International Date Line flip. So Tuesday washes over the earth like a wave. The entire planet is never entirely on Tuesday. During wars, politicians wanted people to get up earlier to conserve electricity in the evening. They came up with the bizarre idea of adjusting the clocks to trick people into compliance. This was originally called war time, then later DST (Daylight Saving Time). It created chaos in many ways. Part of the problem is the days for changing clocks forward and back and whether DST is used at all are completely non-standard. Java has to maintain giant tables to track what each city on the planet does with DST, and the history of what they have done in past. The most important fact to drill into your brain is it makes no sense to ask what day of the week a given instant in time (i.e. Java long timestamp) is. You must ask what day of the week it was at that instant in a particular time zone. It also depends the particular location within that time zone was using DST at the time. Java uses micro-time zones, usually named after cities, each of which has a the same DST rules and history. The moon rotates around the earth once every 27 days and 8 hours, one lunar month (moonth), The Gregorian solar calendar we use today uses a month of 28 to 31 days. The earth rotates around the sun once every 365.242190 days, or one solar year. We use a system of leap years with years of either 365 or 366 days so pretend a year is an even number of days. Human biology is synchronised to the solar day, the lunar month and the solar year. The weirdness of our civil calendars come from trying to pretend that lunar months and solar years are actually even multiple of days. A highly accurate clock that monitors the frequency of light emitted by excited atoms or even a single atom, originally cesium atoms, or clock that is accurately synced to such a clock. The day of the month 1..31. Sometimes called the date. Day of the week for a given date, e.g. Sunday = 1,… Saturday = 7. DST offset. The number of milliseconds correction to account for daylight saving time, 0 if daylight saving time is not in effect for the timestamp specified. If a one-hour daylight saving is in effect, the offset will be 3600000. You add the DST offset and the zone offset to UTC to get local time. A historic time standard derived by observing the sun at the prime meridian at the Royal Observatory, Greenwich, England. It has been supplanted by the more stable SI (Systèm Internationale (metric)) UTC standard based on an atomic clock. Pope Gregory’s calendar we use today that has leap year corrections every 4, 100 and 400 years. Day of the week 1 to 7 for this date according to the ISO-8601 (International Standards Organisation # 8601 (date/time)). Monday = 1… Sunday = 7. Week number 01 to 53 of the year this date falls in, according to the rules of ISO-8601. Week 1 of any year is the week that contains 4 January, or equivalently week 1 of any year is the week that contains the first Thursday in January. A week that lies partly in one year and partly in another is assigned a number in the year in which most of its days lie. Most years have 52 weeks, but years that start on a Thursday and leap years that start on a Wednesday have 53 weeks. January 1 may well be in week 53 of the previous year! ISO specifies a lead 0 to create a 2-digit year. Java does not do that unless you code the display specially. I know of eight different definitions. an extra second added to the day every roughly every 3 to 7 years to keep the UTC clock in sync with the rotation of the earth. an extra day added to the year to keep the calendar in sync with the revolution of the earth around the sun. January to December. Note that in GregorianCalendar, January is month 0. In contrast, in DateFormat, January is month 1. How many milliseconds difference local time is from UTC. If you live is North America this will be a negative number. It is the sum of the zone offset and the DST offset. You add the DST offset and the zone offset to UTC to get local time. In much of the world, people adjust their clocks to trick themselves into getting up an hour earlier in summer. An instant in cosmic time, expressed in milliseconds since 1970-01-01 0:00 in UTC. It can be a positive or negative 64-bit long number. These are sometimes called Dates and sometimes Times. a region of the earth that keeps the same winter time. They may or may not all flip to summer time at the same time and some parts may not flip at all. A TimeZone is a Java class for a region of the earth that keeps the same time. If they keep different time in summer and winter, everyone is the region flips together. The TimeZone class describes the offset from UTC in summer and winter time and when the flips occur of a given time zone. There are many possible definitions. The default GregorianCalendar definition depends on whether you consider Sunday or Monday as the first day of the week setFirstDayOfWeek, (the default is locale specific) and how many days you insist must be present in the first week of the year setMinimalDaysInFirstWeek, (default 1). The first week of the year is week 1. January 1 may sometimes be considered week 53 of the previous year. milliseconds difference that local time is from UTC if you ignore any daylight saving time correction. West of the prime meridian that runs through Greenwich England, i.e. in west Africa and North and South America, this will be a negative number. Also Oceania (aka Oceania) in the Pacific Ocean east of the International Date line will also have a negative offset. You add the DST offset and the zone offset to UTC to get local time. You need to use quite a few different classes to solve even a simple problem involving dates. java.text.DateFormat Used to convert a date to or from a String. Contains an associated TimeZone. java.text.SimpleDateFormat Used to convert a date to or from a String when you want precise control over the format. Contains an associated TimeZone. java.util.Calendar Abstract class that is the mother of all Calendars such as GregorianCalendar. 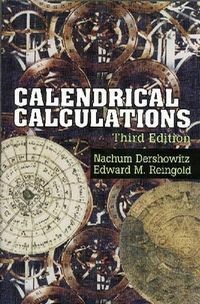 It owns the dozens of magic date constants such as Calendar. JANUARY = 0; Calendar. SUNDAY = 1; and Calendar. YEAR = 1.
java.util.Date Oracle’s first attempt at a Date class. I refer to it as the lemon of Java. It is now almost completely deprecated. It now just basically just a wrapper around a UTC date/timestamp long milliseconds since 1970. Unfortunately, it is still not completely gone. java.util.GregorianCalendar Used to do date calculations. Each GregorianCalendar contains a UTC timestamp and a TimeZone. java.util.TimeZone Contains the name of a time zone and how many hours difference from UTC that time zone is. It also contains the rules for when daylight savings begins and ends. TimeZones are named after cities. They are not the usual names. Here in how to display today’s date. This program will convert a date to a String for display, using the default date format. That format depends on what the user has configured as his preferred date format in the OS (Operating System). You can also use Formatter and printf. Java goes to great lengths to localise date formats, to display dates in the form preferred by each locale. I think this a bad idea. Consider the following date: 11/10/09. What does it mean? the 11th of October 1909, the 11th of October 2009, the 10th of November 1909, the 10th of November 2009, the 9th of October 2011? Everyone will interpret it differently if they see it embedded in a globally accessible web page, especially the Wikipedia, book or magazine. And that is just the tip of the Tower of Babel. We are a global village. We must use a commonly understood date format and that is the ISO-8601 format yyyy-mm-dd. Thus 2011-11-02 means the 2nd of November, 2011 to everyone, unambiguously. If everyone used ISO-8601 format it is would be much easier for search engines to find things by date and to extract data factoids, such as birth and death dates. Further, YYYY-MM-DD dates sort naturally as a simple String. In a similar way, the hodge podge of time zones and insane DST rules means people are always getting confused by published dates and times. We need to standardise on a common format to broadcast timestamps of events e.g. a coronation, namely in ISO-8601 standard format YYYY-MM-DDThh:mmZ so that 2011-11-02T20:46Z unambiguously means the 2nd of November 2011 at 8:46 PM UTC . Software in browsers could optionally convert such timestamps embedded in the HTML (Hypertext Markup Language) back and forth to local time, much the way Google Translate works, but without necessitating any server involvement. Wikipedia. They use hodge-podge of formats including mmmm-dd-yyyy and dd-mmmm-yyyy. MMM Month in year, Jan-Dec. Watch out! If your default locale is Locale.FRANCE this will come out in French with accented letters. MMMMM Month in year, January-December. Watch out! If your default locale is Locale.FRANCE this will come out in French with accented letters. EEE Day in week abbreviation, e.g. Tue. Watch out! If your default locale is Locale.FRANCE this will come out in French with accented letters. EEEE Day in week, e.g. Tuesday. Watch out! If your default locale is Locale.FRANCE this will come out in French with accented letters. Here is how to display today’s date in Zulu ISO-8601 format. Here is how to display local time, to the millisecond. To convert a date from a String to internal format is quite a production. This technique will also validate a date. Just catch the ParseException. Be very careful with TimeZones. If you don’t specify one, your date will be interpreted using the local default TimeZone. If the user has not configured it correctly in his OS, you may get Pacific Standard time or GMT, without warning. Have a look at this example program to calculate how many hours until the next presidential inauguration. You specify the timestamp with GregorianCalendar.set in terms of Eastern Standard time, not UTC. Internally the timestamp is stored as UTC. You don’t create the TimeZone object with new. The getTime().getTime() is not an error. The first getTime retrieves a Date object from the GregorianCalendar and the second retrieves a timestamp from the Date object. Elapsed time in days is not simply hours / 24. It is much more complicated than that. How Long Until Christmas, Daddy? This sounds like a simple problem. Programmers posted many different solutions to the comp.lang.java.programmer newsgroup before the gurus stopped finding holes in the logic. Part of the problem is that the question can have many different legitimate answers. // building a timestamp using default TimeZone. java.util.GregorianCalendar has far fewer bugs and gotchas than the old java.util.Date class but it is still no picnic. Had there been programmers when Daylight Saving Time was first proposed, they would have vetoed it as insane and intractable. With daylight saving, there is a fundamental ambiguity. In the fall when you set your clocks back one hour at 2 AM there are two different instants in time both called 1:30 AM local time. You can tell them apart only if you record whether you intended daylight saving or standard time with the reading. Unfortunately, there is no way to tell GregorianCalendar which you intended. You must resort to telling it the local time with the dummy UTC TimeZone to avoid the ambiguity. Programmers usually close their eyes to this problem and just hope nobody does anything during this hour. The bug disappears at 7AM on 2001/01/01 for MST. GregorianCalendar has the raw GregorianCalendar.get(Calendar.ZONE_OFFSET) and the daylight savings GregorianCalendar. get( Calendar. DST_OFFSET), but no way to get the actual time zone offset being used. You must get these two separately and add them together. GregorianCalendar.set ( year, month, day, hour, minute) does not set the seconds to 0. DateFormat and GregorianCalendar do not mesh properly. You must specify the Calendar twice, once indirectly as a Date. If the user has not configured his time zone correctly it will default quietly to either PST or GMT. In GregorianCalendar, Months are numbered starting at January=0, rather than 1 as everyone else on the planet does. Yet days start at 1 as do days of the week with Sunday=1, Monday=2,… Saturday=7. Yet DateFormat. parse behaves in the traditional way with January=1. Locale.setDefault ( Locale. ITALY) will not have any effect on SimpleDateFormat objects already created. You need to set the default Locale before creating your SimpleDateFormat objects or use the SimpleDateFormat constructor that takes a Locale. Designing calendars is an inherently messy problem. You are try to measure years, days, lunar cycles, each of which only approximates a constant unit of measure. There is no way to do it with a single scheme. You also need a measure that is not connect to astronomy, something as invariant as possible for doing things like measuring the wavelength of light emitted by various excited atoms. Tradition clings to calendars long after they have proved unworkable. Religious people and other zealots think they have the right to redefine calendars. Roman politicians meddled, stealing days from February to make July and August longer. Unix has defined a simple system of measure in milliseconds plus or minus 1970-01-01T00:00. It is effectively a day-counting system. It needs no months, weeks, years or other complicated structure. Perhaps over time it will supplant the other calendars. You can use simple addition and subtraction to do date calculation. 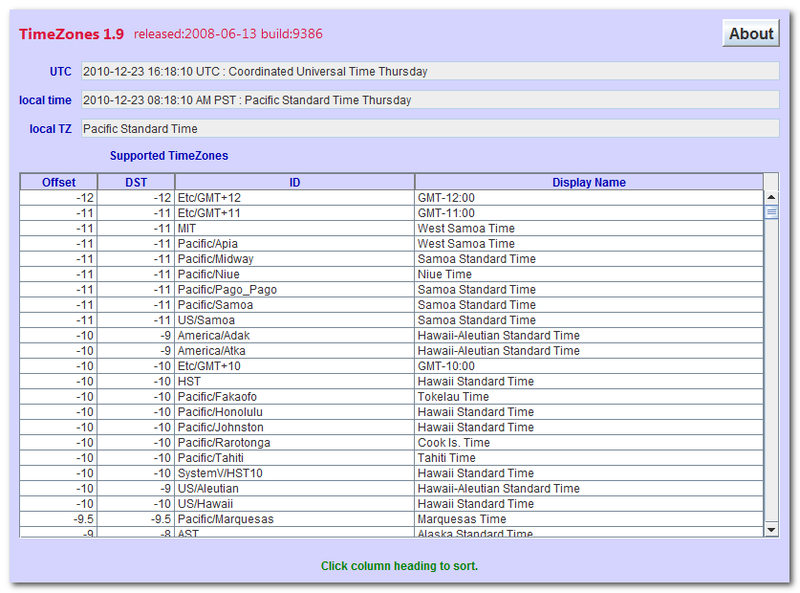 Add column 1 in hours to UTC to get local standard time. Add column 2 in hours to UTC to get local daylight saving time. Use UTC when you want no time zone at all. Use Asia/Riyadh for Arabia Standard Time. Asia/Riyadh87, Asia/Riyadh88 and Asia/Riyadh89 are 3 hours and 7 minutes east of UTC. This is the offset used in 1987 to 1989. Actually it was 3 hours 7 minutes and 4 seconds to approximate solar time. Prior to 1950 they used 3:06:52. In the period 1951— 1986 and 1990 onward they used a simple 3 hour difference. In Islamic tradition, the day starts at sunset. To anticipate some geographical region adopting a quirky daylight saving rule in future. There would be no need adjust to a new split time zone to adopt the new rule. Only the tables built into Java would need to be adjusted. It makes it easier for people to find their own time zone. They need find only a nearby city without having to consult a map to find a distant city on the same longitude. Often they can find their own city directly. How to compute solstices, equinoxes, new moons, Western, Chinese and Muslim holidays. Has been reissued several times. Make sure you get the most recent edition. The calendar classes are full of surprises. To learn more about them see date gotchas.